Loaded with filling protein, healthy fats, and a hearty dose of fruit (and optional veggie), this 5-ingredient very berry smoothie checks all the metaphorical boxes—and tastes great, too. For grab-and-go convenience, smoothie packs can be quickly assembled and stored in the freezer. For years, my childhood friend Christine and I would occasionally grab a bite at a nearby restaurant or café and pack as much catching up into her hour-long lunch break as possible. Somewhere along the way, however, she started coming to my house to eat. We both enjoyed the informality and comfort of home, but I couldn’t remember exactly how the transition originally occurred, so I asked her recently. Christine claimed that she was occasionally running late and didn’t feel as guilty if I could fold a load of laundry or edit a column rather than stare out a restaurant window while waiting. Christine happens to be a smoothie fan. She also knew that smoothies are one of my go-to lunches when time and ingredients are running short, as they take mere minutes to whip up with ingredients easily stored in the freezer and pantry. So when we shifted venues, we made a pact that 1) I should never feel compelled to make something “special” for lunch, 2) she would occasionally make some food-related contribution, and 3) that I could fall back on a super easy smoothie lunch any time—or every time. Having agreed to keep things simple, my blender received consistent use and our lunches actually became more frequent. I couldn’t, however, send Christine back to work, only to feel pangs of hunger by 3:00PM. One size seldom fits all, so there’s probably no perfect smoothie, but that didn’t keep us from aiming high. Our ideal smoothie had to be versatile, filling, and adaptable to sipping or eating with spoon. (Some like to drink a smoothie; others feel more satisfied when they can eat it.) We wanted it to be as healthy as possible, too. With those goals in mind, I started with a full cup of mixed berries for their antioxidant-rich, superfood status. Conveniently, frozen bags of berries are easy to find and can be stashed in the freezer for several months. For the liquid component, we opted for a milk of choice over juice or yogurt. This reduces carbs and sugars while providing a dairy-free and vegan alternative. Finally, there’s added protein and a healthy fat to help keep us full. Happily, our goals were achievable through five easy-to-remember ingredients. Christine and I think it tastes great with these five ingredients alone, but knowing that some people like to tweak (myself included), we tested this smoothie a multitude of different ways to provide a greater number of reliable options. For example, wanting the most bang for our smoothie buck, we began blending in a cup of baby spinach. Greens will dull the vibrant hue of the berries, but the flavor is virtually undetectable. Experts recommend a daily intake of five to nine servings (or 4-1/2 to 5 cups) of fruits and vegetables. 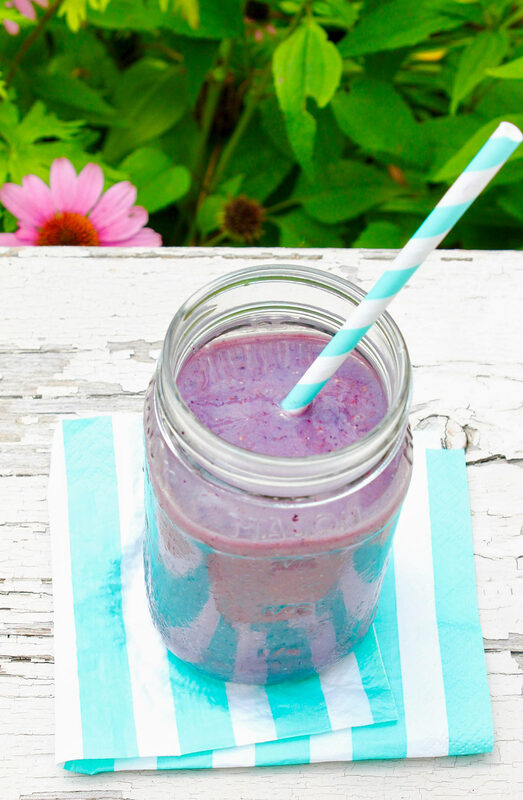 By adding a cup of fresh baby spinach, the following smoothie takes us past the halfway point. For a truly grab-and-go meal, all of the ingredients except the milk can be placed in a quart-size freezer bag. 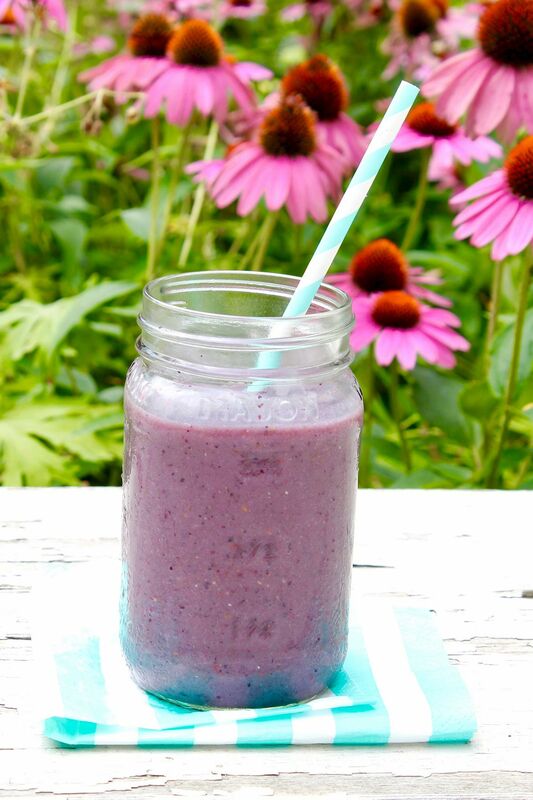 When ready to blend, simply place the contents of the smoothie pack in the blender, add the milk, blend, and enjoy! Loaded with filling protein, healthy fats, and a hearty dose of fruit (and optional veggie), this smoothie checks all the metaphorical boxes—and tastes great, too. 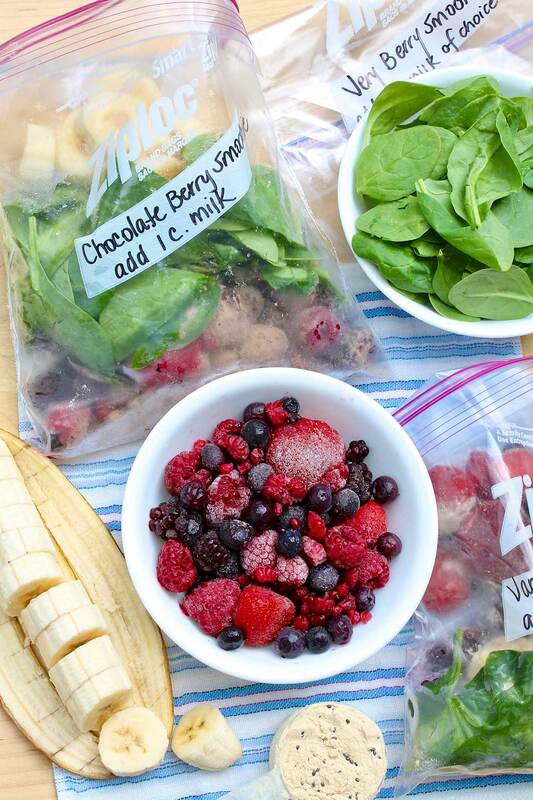 For grab-and-go convenience, make smoothie packs and store in the freezer. If you froze your (peeled) banana whole, roughly chop it. Place all of the ingredients in a blender, and blend until completely smooth. Scrape down the sides as needed. If you have a high-speed blender with a tamper, it helps to keep the mixture going. If your blender does not have a strong motor, I recommend blending the milk and the frozen berries first, and then add the remaining ingredients. That will help avoid overloading the motor. *I typically use Silk’s almond/coconut milk, but use your favorite dairy or non-dairy option. **We’ve enjoyed this smoothie with almond and peanut butter as well as powdered peanut butter (like PB2). For a nut-free version, sunflower seed butter could be used, or simply omit. ***Both vanilla and chocolate protein powder work well in this smoothie. For a healthy, no-sugar-added option that I can find at the grocery store, I like Bob’s Red Mill’s protein powders. If you don’t have any on hand, you may omit. When not using protein powder, I like a small squeeze of honey to enhance the natural flavor of the fruit. For an added nutritional boost, you may blend in 1 cup of baby spinach and/or a tablespoon of chia seeds or flaxseed meal. 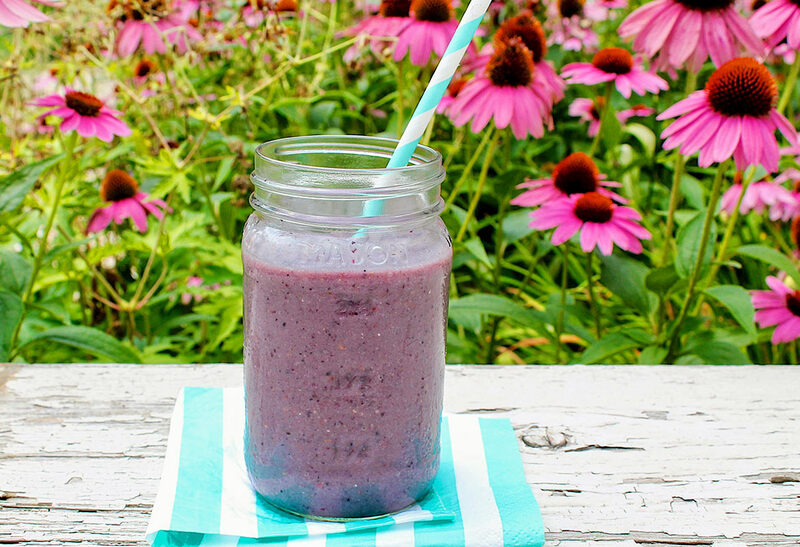 This recipe makes a thick, spoonable smoothie. If you prefer a thinner consistency, you may add more milk or use some fresh fruit instead of all frozen. Tip: Always peel bananas before freezing. For the most natural sweetness, overripe bananas are best. What if you don’t like bananas? Besides the nutrients they supply, their main purpose is to provide creaminess and natural sweetness to a smoothie. Mangos add a similar measure of creaminess and sweetness with a more pronounced tropical flavor. Half a ripe avocado can also be used in place of one banana. It will offer a similar degree of creaminess as the banana, and the flavor is hard to detect. It won’t, however, supply the same level of sweetness. To make up for that, you may wish to add a squirt of honey or sweetener of choice. Optionally, to replace liquid or granular sweetener in smoothies, one Medjool date (pitted) is similar to approximately 2 teaspoons of honey. If you don’t have a high-powered blender and your dates are no longer soft, it will help to soak them in warm water for 15-20 minutes before blending. You are so sweet, Beverley. Thank you! I’ve made this for breakfast every day for the last week. It’s a total winner!! I thrilled it’s a keeper, Kerry!